The new armless pendant is a lighter and more refined version of the original, that incorporates the same beautiful matte finish and polished triangle accents, which represent the underlying geometry of spacetime; the foundational principal of this amazing technology. As the name implies, the arms featured on the original are removed, which lightens the pendant and provides an extra level of sophistication while wearing the ARK® crystal for an evening out, group meditation or gathering. The first production run is limited to 200 pendants. Order while supplies last. Free Shipping worldwide. ARK® crystals are a revolutionary technology that greatly boosts the body&apos;s natural ability to attune with the vitalistic and expansive zero-point field of the quantum vacuum. The quantum vacuum represents the revelatory understanding in modern physics that space is not empty; on the contrary, it is the one thing that connects all things. With this bundle you can create several different geometries including a cuboctahedron, rosette and more! This product is an 8 ARK® Crystal bundle without pendants. 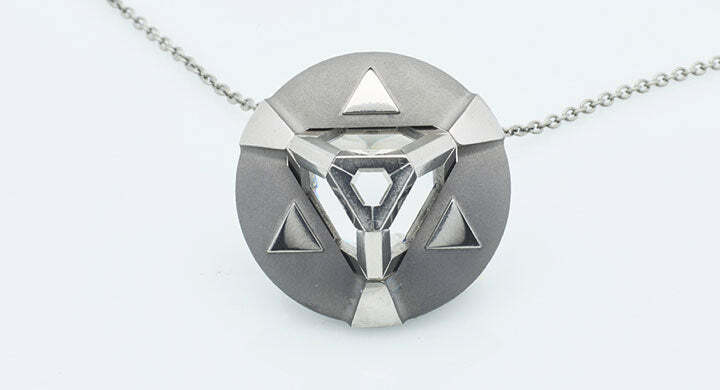 Unleash the power of Advanced Resonance Kinetics with our new, exclusive armless pendant. This design is refined and allows your ARK Crystal to candidly shine. Proudly wear your ARK® Crystal in a setting that shows off its beauty, elegance and grace. Our exclusive armless pendant embraces the allure of the ARK.